If you go to the gym or an upmarket spa regularly, you are sure to have encountered the sauna. Not everyone, however, wants to share a public sauna, nor can they afford to have one built at home. What is the option? A portable sauna, of course.But are they safe? Can anyone use it? What are the benefits and concerns? These are the questions anyone will ask of themselves. Well, the good news is we have done the legwork for you. 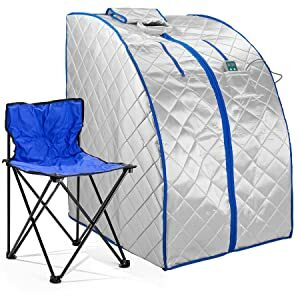 Not only have we addressed the issues, but added in our own portable sauna reviews, so that you can sit back and relax while deciding on the best portable sauna option for you. 1 Types of portable saunas. 1.1 Portable FAR Infrared Sauna. 2.1.5 6. Durherm X Large EMF Free Negative Ion FIR Infrared Portable Indoor Sauna. 2.2.1 12. 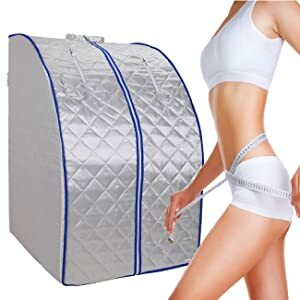 Personal Steam Sauna SPA Portable Therapeutic Weight Loss For Body. 2.3 13. Durherm Portable Personal Folding Home Steam Sauna. 3.1 So what do you look for? 4 What are the health benefits of a sauna? There are basically two types of portable saunas, the first type is a portable far infrared sauna. 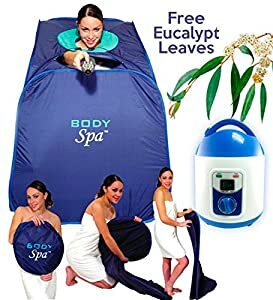 The second type is a traditional portable steam sauna. Both of these types of the sauna as do what they are supposed to efficiently. A traditional steam sauna, as opposed to the infrared variety, uses radiant heat to warm air which then heats up your skin and body. An infrared sauna heats your body directly without having any effect on the air around you. 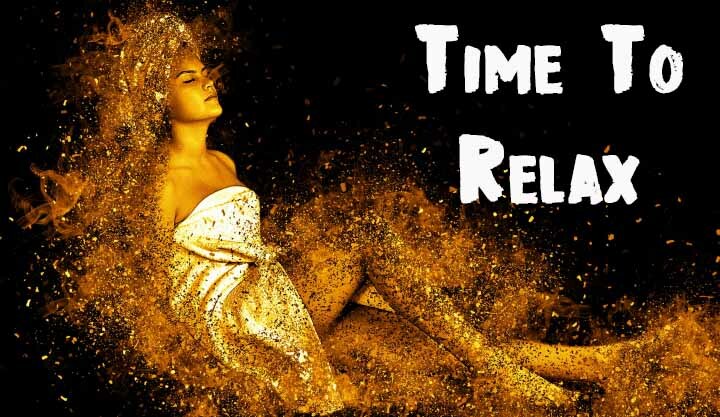 The whole idea of an infrared sauna is that it can produce traditional results in a human body at much lower temperatures than a conventional sauna. Just what is a portable FAR infrared sauna? An infrared sauna is basically a type of portable sauna that uses light to create heat. Sometimes an infrared sauna will be called a far-infrared sauna. “FAR” just tells you whereabouts on the light spectrum the infrared waves used by that particular sauna fall. 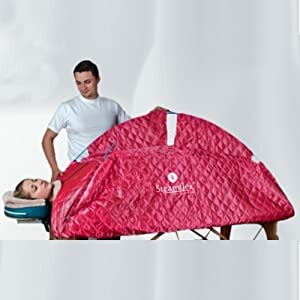 If you are contemplating buying a portable infrared sauna then you should probably, first of all, read some portable sauna reviews to determine which one is the best for your needs. 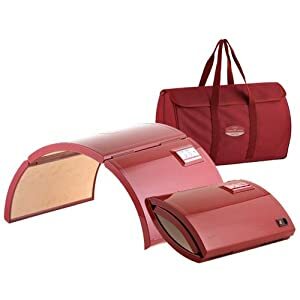 There are numerous portable infrared saunas available on the market and the best portable infrared sauna will be listed on any website that does portable infrared sauna reviews. Steam saunas will heat a room more than an infrared sauna and the other major difference other than the temperature is going to be the humidity, generally, an infrared sauna will only supply a humidity of around 20%, whereas a steam sauna will raise the humidity to up to 65%. Visiting any type of sauna is not recommended for people who have already had a stroke or a heart attack. For steam saunas, look for best portable steam sauna reviews. Here are a few product reviews on portable saunas checked out by our team for your convenience. Please do let us know whether they are of any help. This portable sauna is rated one of the best solo saunas available. Nearly every person who has reviewed the sauna however says for the money it is excellent value. 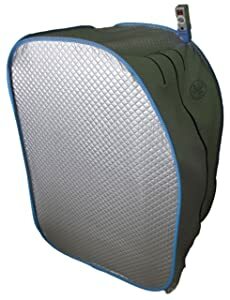 The overall package of this portable sauna weighs in at just under 9 kg or 18 lbs, so it can be moved by one person quite easily as that weight puts it under the average suitcase used to traveling. The portable sauna is easy to install; you don’t need any tool to complete the setup. The support system is made from solid hardwood dowel frame, making it durable enough to last long. 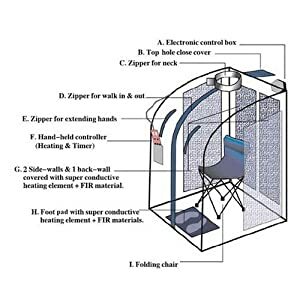 The sauna also comes with a portable chair with Oxford canvas fabric and is easy to set up. It has 6 preset temperature options for easy temperature adjustment. There’s a complaint about this sauna being slow to heat up, forcing you to wait a little longer than necessary. The portable chair or stool is not of best quality, so you might want to minimize movement while using it to avoid any accident. This portable sauna has a reputation for being a rugged little number, it is very solidly made and people say it is both great to detox and for weight loss. This infrared portable sauna has intelligent temperature presets in automatic mode, as well as with automatic safety features. It is portable with a weight under 18lbs. It uses carbon fiber heating panels. 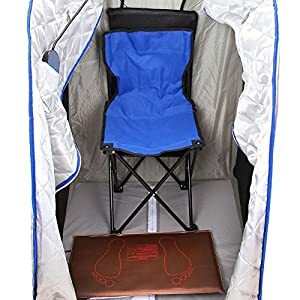 The only major complain about this sauna is the portable chair that comes with it. The chair is either too small or too low, making it less desirable for people with huge body structure. People with arthritis complain about the chair, forcing them to buy camping chair for additional dollars. This portable sauna has a few more features than average. It is designed to set up and then fold up very quickly and easily without any tools. The power input of courses 1000 W meaning the sauna will heat up to a maximum of 140°F within 5 minutes. It has a timer system that allows you to choose from 5 minutes to 60 minutes. For your safety, it has a temperature control. The neck collar of the sauna is removable, allowing you to clean it for hygiene purposes. It has a total weight of 18 lbs which is light enough to move around. The chair cannot support those people who weigh 160 pounds and more. The heat is not well-distributed. The heat in this sauna is concentrated more at the back and on the sides. This particular portable sauna is well known for two things. First it is one of the fastest to heat up, it has all-round heating elements that heat up and produce a good sweat in a very fast time. It is also known for being able to comfortably accommodate larger people. A lot of the other reviews about this sauna state that the heat generated by it penetrates a lot deeper than cheaper, less well built models. Some of the criticisms of this portable sauna are almost laughable. The heat penetrateswell inside the sauna, giving you a comfortable and relaxing feeling. Most buyers of this sauna commended it for the great service. They claim to have gotten what they paid for. The sauna heats up quickly; the heat is on full blast after just 2 minutes. The design is not appealing, but still, it doesn’t affect the overall performance. The sauna weighs about 32.5 pounds. It’s heavier as compared to the other saunas mentioned above. 6. Durherm X Large EMF Free Negative Ion FIR Infrared Portable Indoor Sauna. 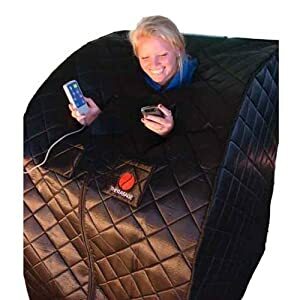 As the name might suggest, this portable infrared sauna is definitely designed for the larger persons. There are reviews of people who weigh in near 300 pounds having no trouble fitting inside this sauna. For its sheer size its weight of 25 pounds is quite surprising. One of the major selling point is the manufacturer uses to market this particular sauna is its low running costs. They are using three separate heaters made of high-tech superconductive and ultra-thin tourmaline panels exclusively manufactured for them in Japan. This effectively means this sauna uses about one quarter of the electricity of its nearest competitor. This sauna has no electromagnetic radiation or negative ion, so you can guarantee its 100% safe to use. It also comes with an integrated foot pad which is heated. It generates more heat without consuming too much power, making it a top choice among other energy-saving saunas. The chair is a big downer; it is too low for people with a height and build. There’s a complain about its package about missing parts and loose stitching. An affordable, high-quality product that makes use of far infrared can be used anywhere. It takes up comparatively little space and can be conveniently stored away after use. This makes for convenient use. They say dynamite comes in small packages. 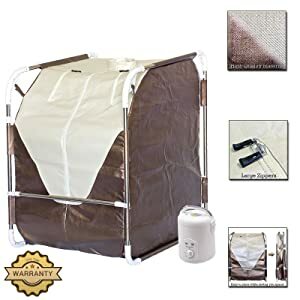 This is certainly the case with this portable home sauna, as its unique design allows you to fold it up and easily pack it away. Storage is not a problem with this product. Insulation is a bit of a problem. Covering it with an additional blanket solves this problem. A product that does what it says it will do. The safe, therapeutic heat warms and relaxes. This product is relatively quick and simple to set up and take down. It also heats up to the maximum temperature of 140 degrees Fahrenheit within about five minutes. The product is very easy to set up and simple to maintain. The two portions slide together for easy use, and, stacked together, take up little storage space. 12. 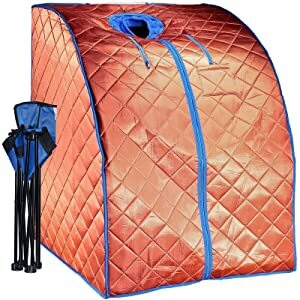 Personal Steam Sauna SPA Portable Therapeutic Weight Loss For Body. Even though this is called a steam sauna, it is actually marketed as a body spa. It is basically a giant bag that you attach the steam blower unit to and then get inside and turn it on. You can add things to the steam like essential oils. Most of them seem to come with some eucalyptus leaves for adding to the steam. This sauna can accommodate people with 250 pounds weight. You can get free eucalyptus leaves. It helps people lose some weight after consistent use. This sauna doesn’t have a portable chair with it. The eucalyptus leaves can clog up the filters which are hard to clean. 13. Durherm Portable Personal Folding Home Steam Sauna. 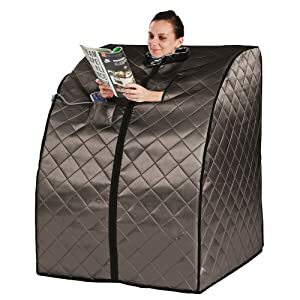 This particular portable steam sauna seems to be the universal favorite pick of its reviewers. They all say it is very easy to set up. Very easy to operate and does an excellent job. As well as being easily the cheapest of all of the saunas reviewed here. This particular sauna seems to be very popular amongst a group of people who you would class as experienced sauna users. It does have some drawbacks but for the money asked you can’t go past it. This sauna is space saver and portable with a total weight of 11lbs. You can set up the timer for up to 60 minutes. It is easy to set up with is inside-frame design. There is no portable chair in the package, so you need to buy your own. Some buyers complain about its poor design. The full body steam is quite tricky; make sure you stay away from the steam outlets. The product is relatively easy to set up inside its frame. The product is easy to clean and folds away nicely for easy storage. Lightweight and collapsible, the product folds really well, fitting into a pouch that makes for easy transfer and storage. It is a great product for not only home use but for a mobile spa at a client’s home. Infrared and steam sauna. You need to decide on which of the two kinds suit you. However, no matter which option you choose, you still want to choose the best infrared sauna or best portable steam sauna that suits your own specific needs and purposes. Do you want to sit in the sauna or lay down? Both options are available. When looking at each, make sure that there is sufficient space for you to either lay down or sit in it. Some people, after all, are taller than others, so make sure you get the right fit for you. Another question to consider is whether you want the regular steam sauna or an infrared one. The steam sauna produces steam by heating up water. This steam, in turn, causes you to sweat. These saunas usually operate at quite high temperatures, so you need to be careful when using them. If going for the infrared option, make sure that you check up on the placement of the heating pads. Do you want the whole body heated, or just a certain section.? The infrared sauna does not make steam. Instead, your body is heated, causing it to sweat. This option also allows, usually, for lower energy usage and less electromagnetic radiation. It also operates at a much lower temperature. A sauna has many health benefits and is often used as part of massage treatments. Not only is it great at improving circulation, but is excellent at treating pain as well. This does not only include muscular aches and sprains but a host of illnesses as well. Amongst those who have found relief from saunas are counted people with fibromyalgia, leg pain, peripheral arterial disease, and even arthritis. In fact, the therapeutic effect of a sauna treatment seems to soothe most types of pain. The feet have specific points that correspond to the other parts of the body and applying pressure on these certain parts of the feet is a proven way to relieve a person from the aches and pains the feel on those exact parts. If you suffer from headaches, migraines, neck pain, and lower and upper backaches, purchasing one of our best foot massagers will be a great investment. You can ease your aches and pains without the hassle of going to a foot spa. Additionally, most people that use saunas regularly comment on added weight loss. This is because your body heat is increased which, when improving your circulation, also improves your metabolism. As a result, your body uses more energy and starts breaking down fat in order to supply this need. 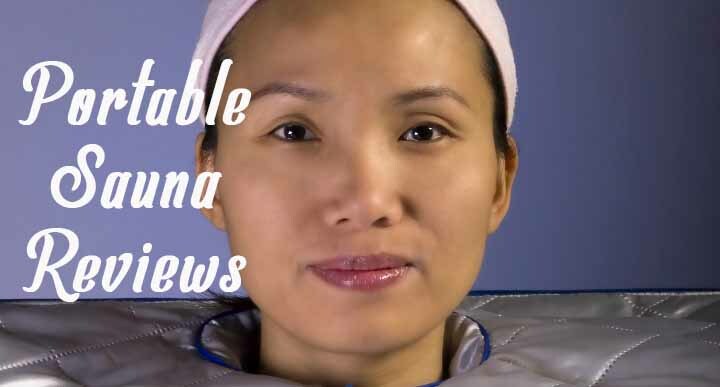 For more on weight loss and other associated issues, please have a look at ‘Get rid of stubborn weight with this simple tool’, ‘Reliable Sauna Suit Reviews for Amazing Weight Loss’ and “The Best Infrared Saunas and Their Many Benefits“. We look at the benefits of each and give our opinion on a few of the best available products on the market. Because you sweat in a sauna, you detoxify each time you use it. Your body, besides your liver, detoxifies itself, in other words, rids itself of toxins, through the sweat pores. The therapeutic effect does not end there. The heat causes your body to go into a deep state of relaxation, while your pores are cleaned, giving you a healthier, clearer looking skin. Prolonged high temperatures could have an adverse effect on your health. For example, because of your body, especially the skin, heats up, the heart has to work harder to pump blood to this area. This may mean blood is taken away from the internal organs, causing a drop in your blood pressure. Those with heart conditions may also have their health compromised by prolonged use. Another thing to be careful of is dehydration, as the body loses a lot of water due to sweat. It is thus very important that you drink a lot of water before or while using the sauna so that your body stays hydrated. Certain medical conditions or the use of alcohol may also cause a sauna to have an adverse effect on your health. If you thus have any medical conditions, it is advised that you first consult your healthcare professional before using one. Size does matter! Not everyone has the space for a sauna room. A portable sauna does not need a designated space. You can put it up, use it, pack it up, and put it away. Cost is a factor. When looking at pricing, a portable sauna gives you all the benefits of a regular sauna at a fraction of the cost. You are also not limited as to where you can use it. It can be used in any room of the house. You can even use it while watching your favorite television show. Of course, if you feel you cannot live without your sauna, nothing stops you from taking it with you and using it on vacation. 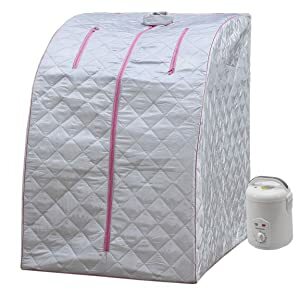 It does not really matter how many portable sauna reviews you read, the fact is, you need to decide on the best portable infrared sauna or best portable steam sauna that best fits your personal needs. We hope we have helped you in this regard. For us, our firm favorite is the Ridgeyard Foldable FIR Far Infrared Portable Indoor Sliver Sauna Spa. It is great value for money, and extremely easy to set up and use. Plus, we liked the ionizing treatment that goes with it. The built-in shutoff feature is an added safety feature that ticks an extra box. Please do feel free to share this information with anyone out there you feel may also be interested. We would really appreciate it.